Nov. 13, 2009 It’s fitting that The Laramie Project premiers locally tonight in San Mateo on Friday the 13th, as the theater production resurrects a haunting melancholy on the ‘unlucky’ and fateful day young Matthew Shepard was kidnapped, severely beaten and left to die suffering for six days tied to a fence on the outskirts of Laramie, Wyoming. Reason for the hate crime? He was gay. Sure enough, a random poll of middle school teens (here in the Bay Area ‘burbs, no less!) 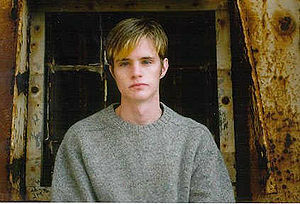 said Matthew Shepard’s name ‘sounded familiar’ but couldn’t place the person or even the act itself. Most of the theater events around the world took place on the exact anniversary of his death, October 12th but somehow, tonight, Friday the 13th is equally appropo, reminding of the ‘luck of the draw’ when it comes to homophobic viciousness and the need to advocate for human rights universally. By now, The Laramie Project (Pt 3, Audience guide for discussion) has been seen by over 30 million people across the country, as one of the most performed plays; a veritable staple in some high school theaters. I’m very curious to hear the different answers in different regions at various ages and stages. The Laramie Project is a play based on interviews of the people of Laramie, Wyoming, made after the brutal killing of Matthew Shepard who was beaten, robbed and left to die tied to a fence. The incident made national news, and the 10 year anniversary was commemorated on October 12th with events across the world. The play reveals the feelings, thoughts and reactions of those in the town in the wake of his death. TICKETS: Reservations: call 650-345-2381 Pricing: $10 – $20 (under 14 – free)* *Please note that The Laramie Project contains adult themes (violence, sexuality) and some strong language, and is not appropriate for younger children. VISA/MC accepted Walk-ups welcome, but seating is not guaranteed.